I love mythology and other legendary stories that seem to transcend time. There’s something about these stories that have enchanted us since the beginning of time. 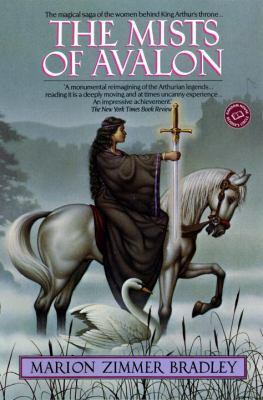 Recently, I decided to try to learn more about Arthurian legend, and I stumbled across a great re-imagining of this traditional story from the perspective of the female characters: The Mists of Avalon by Marion Zimmer Bradley. While this book leaves out a lot of the original legend, it is a fresh retelling, and it was interesting to see the differences in having the stories told from the female character’s perspective. The much-maligned Morgaine is shown in a much more sympathetic light in this version. I was awed by the expansiveness of this book. It is almost 900 pages long and seems to encompass the entire Arthurian time period. It’s definitely not a light read, but it is an entertaining one. I felt fully pulled into this world, and I loved the historical insertions about Christianity and Paganism, which I somehow hadn’t considered before during reading about Arthurian legend. I’m not sure how die-hard scholars of Arthurian legend will feel about this as some things are definitely portrayed differently here, but I think the casual enthusiast or someone who is just interested in learning more about these legends will find the book interesting.